Winter may be a dreary time of the year with its overcast days and long somber nights, but for those who grow Cattleya trianaei, it is a time to enjoy one of nature’s most colorful and captivating flowers. Because it blooms in the winter, C. trianaei is one of the most beloved of all the Cattleya species, for it appears when we need nature’s beauty most. Yet, its appealing flowering season tells only a small part of the story of this wonderful orchid. Of all the Cattleya species, C. trianaei stands out as a model of perfection, for it possesses the best qualities of the genus. Cattleya trianaei has the finest-shaped flowers of all the unifoliate cattleyas and the greatest range of color. It has many lovely pastel shades and varieties with flares, feathering in the petals and the most delicate and glistening textures. Despite its delicate texture, C. trianaei lasts in flower longer than any other Cattleya species, and five weeks is not uncommon. Only Cattleya schroderae, a close relative, equals it in the longevity of its flowers. Cattleya trianaei is a vigorous grower, making two growths a year, one right after the other, with flowers on both of them. It is quite resistant to rot and handles overwatering better than most Cattleya hybrids. Had C. trianaei been discovered at the same time as Cattleya labiata, it would undoubtedly be the “type species” today for the unifoliate cattleyas. Cattleya trianaei was first described by H. G. Reichenbach in the German botanical publication Botanische Zeitung in January 1860, but it was actually discovered by European collectors 18 years earlier. The first to find it was the Belgian Jean Jules Linden, who came across it in 1842 while traveling near Fusagasuga, Colombia, but he didn’t collect any plants. The first plant reaching Europe came as a gift to a Mr. Rucker of Wandsworth from a friend in Colombia. When it bloomed, Rucker gave the flowers to the English botanist John Lindley, and C. trianaei should have been made a new species then, but John Lindley didn’t have enough information about the plant to say it was really different from C. labiata. Lindley did write about it in the magazine Flower Garden in 1850, and referred to it as Cattleya quadricolor to reflect the four colors in the flowers — dark purple, lavender, yellow and orange — but that’s as far as he got. Of the many new orchids Linden introduced to the horticultural world in Europe in the 1800s, C. trianaei seemed to have been his favorite. Its plentiful supply and wide variety of color types made it a collector’s dream, and Linden was happy and eager to promote it. He was the first to discover it and the first to have it commercially available. He pushed his friend, Reichenbach, to publish a description of it as a new species, and pictured 41 different clones on 28 full-color plates in his famous Lindenia, including a gorgeous double page spread of eight. He featured it at flower shows and even produced a special exhibition for it in 1870 at the Brussels Zoological Gardens where he displayed 240 different clones with more than 900 flowers. It seems only fitting that Linden named C. trianaei in honor of a native Colombian, because Colombia and C. trianaei are inexorably tied together. Cattleya trianaei is the national flower of Colombia and it grows abundantly in many parts of the country. It seems every Colombian has his or her own collection of favorite varieties of C. trianaei and despite what you read in the newspapers, Medellín, Colombia is famous first as the home of C. trianaei and only second as the home of the cocaine cartel. Like Cattleya mossiae in Venezuela, the Colombian C. trianaei was found in such great numbers that literally hundreds of thousands of plants were imported into Europe and the United States after its discovery. Cattleya trianaei was so plentiful and inexpensive to import that it was rarely raised from seed, and the cut-flower growers of the 1930s and 1940s could actually import plants, grow and flower them for a year or two, throw them away, and still make a good profit on the cut flowers. The accompanying picture I took at Thomas Young Orchids in 1948 shows part of one of their six greenhouse full of flowering C. trianaei. This was Thomas Young’s smallest greenhouse of C. trianaei, and it is a sad commentary to the history of orchids that the C. trianaei, in all six of their greenhouses, were thrown out on the dump to die right after this picture was taken, and the flowers cut for market. Cattleya trianaei also ranks with C. mossiae in having the greatest number of named clones of the Cattleya species. An inventory of the famous Dixon collection in 1930 listed 68 outstanding clones of C. trianaei and there were hundreds more in other collections and in the literature. By 1916, the Royal Horticultural Society in England had awarded 22 First Class Certificates and 24 Awards of Merit to C. trianaei, and the American Orchid Society has made C. trianaei one of its most-awarded unifoliate Cattleya species. Several fine white clones of C. trianaei have been found over the years. Linden pictured a particularly beautiful one in his first volume of Lindenia. In the 1930s and 40s, C. trianaei ‘Broomhill’s’ was the leading white clone, and it commanded a king’s ransom because it bred true white color and had high fertility. 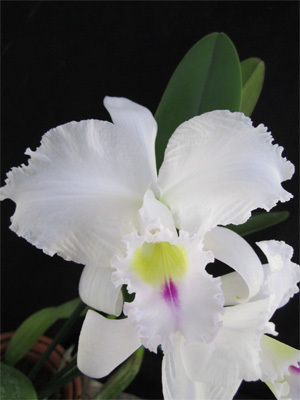 It was used extensively in breeding winter-blooming white Cattleya hybrids during this period. More recently, C. trianaei ‘Aranka Germaski’, FCC/AOS, has received much recognition because of its fine shape, but it is not a good breeder. Really fine semi-alba C. trianaei are rare, and C. trianaei ‘Trenton’ is the best I have seen. There are a few better-shaped semi-albas, but they lack Trenton’s rich coloring in the lip. Fine lavender C. trianaei are quite plentiful and range from pale pastels like ‘The Baron’, FCC/RHS, and the beautiful pinkish ‘Mrs. F.E. Dixon’, through medium lavenders like ‘The President’, FCC/AOS, ‘A.C. Burrage’, AM/AOS, ‘Jungle Queen’, AM/AOS, ‘The Premier’, FCC/RHS and ‘Clinkaberryana’. Really good dark forms like ‘Mary Fennell’, HCC/AOS, are much harder to find. Cattleya trianaei has a great many lavender varieties with dark purple flaring along the tips of the petals. C. trianaei ‘Mooreana’ FCC/RHS, AM/AOS is perhaps the most famous. There are also some truly unique clones like Linden’s C. trianaei ‘Striata’ and Fennell’s ‘Jungle Feather’, which have a feathered pattern along the central vein of the petals. There are also some striking blue clones like ‘Steven Christoffersen’, ‘Blue Bird’ and Linden’s ‘Coerulescens’. But it is the many delicate pastel shades of color that set C. trianaei apart from the other Cattleya species. Even H. G. Reichenbach in his original description said of Cattleya trianaei, that “there may be no cattleya existing which has more beautiful coloring,” and if you see a greenhouse full of them, you will know what he meant. 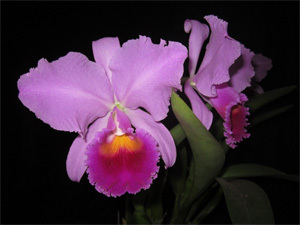 Cattleya trianaei ,more than any other species, gives fine round shape to Cat-tleya hybrids, and many primary hybrids of C. trianaei have better shape than most complex hybrids today. 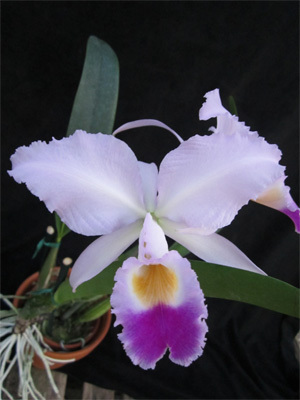 Some particularly fine primary hybrids are Cattleya Princess (trianaei x lueddemanniana), Cattleya Ballantineana (trianaei x warscewiczii) and Cattleya Maggie Raphael (trianaei x dowiana). When the holiday spirits have drained away, and the winter winds begin to blow, and everything outside is cold and sad and colorless, don’t be concerned, for that is when Cattleya trianaei will give you a carnival of happy color. Her sunny smile will warm your winter hibernation with grace and beauty, for she is truly a lovely lady of winter. Cattleya trianaei is as easy to cultivate as most cattleya hybrids and it will grow well in any medium you use for them. If you start C. trianaei growing early in the spring, right after it finishes blooming, it will complete its first growth by early summer, and rush into a second growth that will be completed in late summer. Be certain not to dry the plant off after the first growth is completed, however, or it may not start the second growth. Both growths should produce flowers in late December through February, after its autumn rest. If you want to produce the best flowers, avoid repotting the plant as long as possible, and only repot when new roots emerge from the lead pseudobulb. Like other Cattleya species, C. trianaei should have lots of sun and air and the leaves should be a light green color. Do not let the leaves get warm to the touch, however, because this is too much sun and may burn the leaves. Always keep C. trianaei slightly dry during its rest period to avoid rotting the roots, and start the plant growing right after flowering with frequent light sprays of water on sunny days. Cattleya trianaei usually produces only two or three flowers per stem, unlike most other major cattleya unifoliate species like C.mossiae, C. labiata and C. dowiana, which produce four or more per stem. Two growths in succession, of course, will give you a splashy five- or six-flower display, so the net effect is the same. — A.A. Chadwick.